Can’t sleep. Guess spending most of the last month in a mild doze has taken up all the sleep for a while. I’ll have to get at least a little though, stuff to do tomorrow and I need to get something vaguely resembling a stable sleep cycle by next week. I know how to fix this, wine & philosophy. I even have some chocolate if things get desperate. Here’s a thought that blows my mind. The universe is 13.7 billion years old, and 48 billion light years in diameter. This means that, averaging since the beginning of time, the distance between the far edges of the universe grows at nearly twice the speed of light. Yet no object can move faster than light relative to any other object. There’s a point at the fulcrum that does not move. I suppose I’m still feeling introspective. I looked at the latest Zen Pencils and found a Sylvia Plath quote that I could deeply relate to. Go take a look at it. I’m not familiar with the fig tree analogy, though, I usually heard about it as a hallway filled with doors, all open and filled with opportunity and just waiting for you to step through. In my last post I mentioned our connection to the stars and the universe, and I’ve been thinking about that some more. Consider for a moment that every atom that makes up your body was part of a star once. Think about some of the implications. There’s a young Earth creationist group whose favorite tactic is the phrase “Were you there?” They train children to ask this question in schools, at museums, anytime someone talks about something happening millions of years ago. It’s every bit as childish and annoying as you imagine, all the irritation of a four year old repeatedly asking “why?” with none of the actual curiosity. Bad Astronomy featured this pic today, which came from the ESA spacecraft Rosetta. 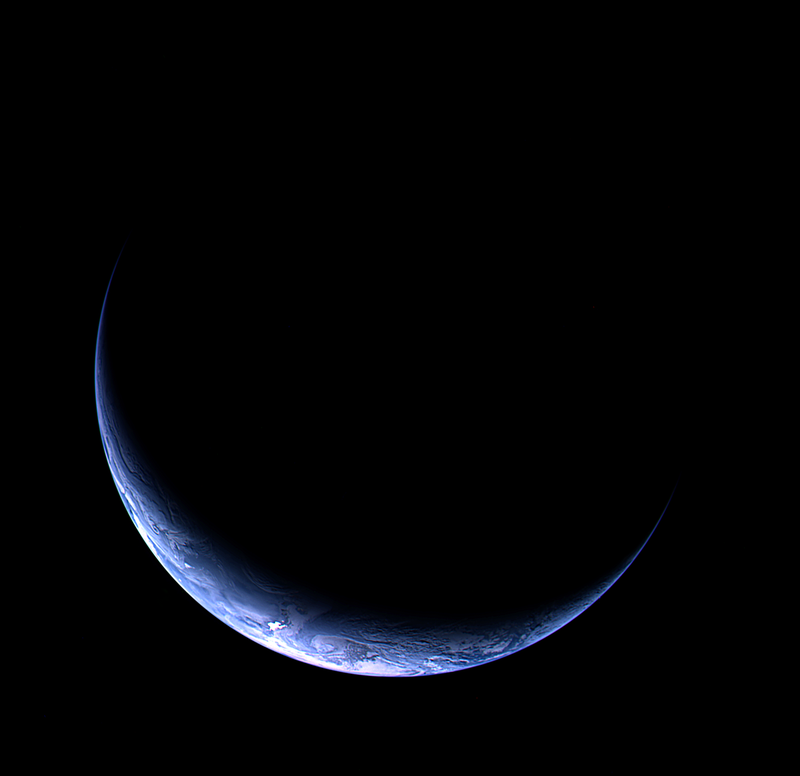 Crescent Earth from 633,000 km away. Tags: bad astronomy, beautiful world, holy crap that got long, human conflicts, postaday2012, pretentious philosophizing (redundant? ), spaceship Earth, when I started this post I just wanted to say "look at the pretty picture"
I often hear people speak about living with no regrets, and when I actually stop to think about it, I wonder what they mean by that. See, from my point of view I can only see three ways to live without regrets, all of which result in a life I wouldn’t want to live in the first place. First, I could live totally alone and never interact with people. Why bother? Even at my most reclusive times, I can only bear to be alone for so long. Third, I could just not care. Just live without empathy or compassion. Perhaps I could enjoy a life such as that, certainly many people seem to enjoy it. But appearances often deceive, and I suspect many of them are neither as callous nor as happy as they appear. While there are certainly simple pleasures to be had, all the greatest joys of my life come from the warmth and love I share with those closest to me. If you interact with people, you will occasionally hurt them. If you consider your life and your actions, you will notice this. If you care about the pain of others, sooner or later you will pick up some regrets. And really, that’s ok. We’re imperfect beings in an imperfect world, doing the best we can with what we have. See the thing is, I don’t think most people who speak of living without regrets mean the same thing the phrase brings to my mind. I see a thousand little regrets everywhere, swimming around the great big leviathan regrets like pilot fish around a shark. I think to most, the phrase means not to never have regrets, but not to dwell on them. Not to let them weigh you down until you drown in that sea. There’s certainly something sensible about that. What does “no regrets” mean to you? I’ve never known what I wanted out of life, in fact the question never really made sense to me. Life isn’t something I chose to get into for some sort of goal, or purpose, it was thrust upon me unasked-for before I knew anything about anything. Literally. Look, I know that there is a universe outside of my personal perception, vast beyond proper imagining, next to which I am infinitely small. But in a very real way, at least from my point of view, my life is literally everything. You might as well ask what I want out of the whole universe. I suppose that provides a simple, but woefully incomplete, answer for what I want more of in my life: knowledge and beauty. Not necessarily in that order, and mingled together as much as possible.